Boil the couscous in a slightly salted water for 6-7 min. Bake the asparagus (without the stubs) on 220 degrees in a preheated oven with 1 tbsp. olive oil and a pinch of salt and pepper for 12-17 min. In the middle of the baking process, you should flip them. After that pour 1 tbsp. lemon juice over them and cut them into short pieces. Let the vinegar boil in a pan over a medium heat and let it reduce in half. Stir it well, after it cools down, and mix it with the rest of the ingredients (without the couscous, tomatoes and asparagus). 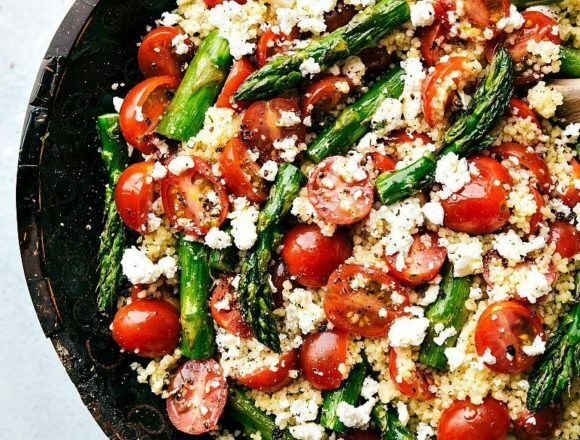 Add the couscous to the tomatoes and asparagus, pour the dressing over them and sprinkle with the grated cheese.